I am thrilled to be a stop on the blog tour for Pure by Jennifer L. Armentrout hosted by Valerie at Stuck in Books! Goodreads Summary: There is need. And then there is Fate... Being destined to become some kind of supernatural electrical outlet isn't exactly awesome--especially when Alexandria's "other half" is everywhere she goes. Seth's in her training room, outside her classes, and keeps showing up in her bedroom--so not cool. Their connection does have some benefits, like staving off her nightmares of the tragic showdown with her mother, but it has no effect on what Alex feels for the forbidden, pure-blooded Aiden. Or what he will do--and sacrifice--for her. When daimons infiltrate the Covenants and attack students, the gods send furies--lesser gods determined to eradicate any threat to the Covenants and to the gods, and that includes the Apollyon... and Alex. And if that and hordes of aether-sucking monsters didn't blow bad enough, a mysterious threat seems willing to do anything to neutralize Seth, even if that means forcing Alex into servitude... or killing her. Jennifer L. Armentrout has made a name for herself in the YA urban fantasy market and with good reason. Her books have this exciting, unputdownable quality to them that I love. Pure is no different. Plus, I’m a mythology junkie and with furies, oracles, Greek gods and demi-gods, I devoured this book and can’t wait for the next in the series. Pure picks up shortly after Half-blood (read my review of Half-Blood here) with Alex attending school at the Covenant and playing catch up with her training. In addition to Alex being trained by her off-limits crush, Aiden, she now has to spar with Seth, the Apollyon and the one she is ‘fated’ to be with. The world of these demi-gods is more fully explored in Pure and we get to see the politics of their society. We also see the segregation between the Pures and the Half-bloods and it eye-opening. I really hoping that at some point in the series, there will be a slave revolt and the Half-bloods, especially the ones in servitude, will rebel and lay the smack-down on the Pures. The Pures so have it coming to them. Ever at risk of being thrown into servitude herself, Alex continues to be hot-headed, impulsive and snarky although we do see her maturing quite a bit throughout the book, especially when she considers the consequences of some of her actions. Alex has a huge destiny to fulfill, one that she does not fully understand. She also has a lot of enemies and people working for her to fail. I’m looking forward to seeing the character grow throughout the series and really take control of her destiny especially when so many are trying to dictate it for her. There is a love triangle in the book with Alex caught between Aiden and Seth. Seth is like the male version of Alex but he is even more hot-headed and impulsive than she is. Aiden is the opposite of Seth: he is calm, sensible, rational, even tempered and it’s obvious that he cares deeply about Alex. I know a lot of you may disagree but since I usually go for the good boy over the bad boy, I’m Team Aiden all the way! Pure has exciting fight scenes, hot romance, a main character that you love and root for and enough Greek mythology to make me happy. 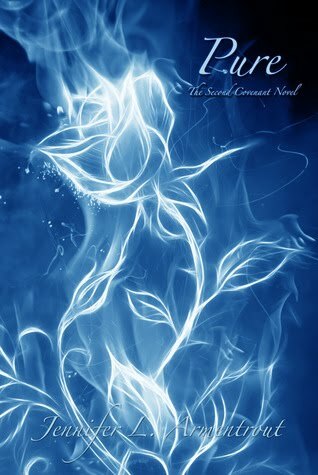 I cannot wait for the third book in the series, Deity, which is scheduled for Nov. 2012. Content: Kissing, sexual situations, profanity, underage drinking and violence. Great review.....I'm just aching for a copy of this. Cannot wait! I keep hearing so much praise for this book. Can't wait to read it! Great review! I can't wait to read pure. I have heard so many great things about the book.